Witamy! Over the past few weeks we’ve been signing our book at several Polish church festivals up and down the East Coast. 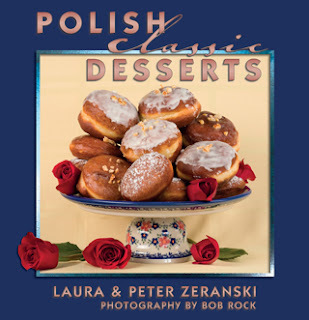 Quite a few folks have asked if our book contains a recipe for Czarnina (Duck Blood Soup) which holds a legendary spot in old traditional Polish cuisine. Poles remember it from their childhoods and having tasted it at their Babcia’s table. Today, I submit that this dish is one of those legends that gets bigger with age, but it also fades with age when trying to remember how this soup actually tasted. Duck blood?? For real?? Even though I can’t get my head wrapped around the idea of sipping the blood of a duck, even cooked, we would have included it in our book – if the ingredients were easier to find. I called our favorite butcher and was told that fresh ducks were readily available, but only cleaned and dressed. With all the regulations on commercial food handling, I’m guessing that no one will guarantee the freshness and safety of the blood. I suppose one could get fresh blood directly from a farmer...if one knew a farmer. Do you know how to get fresh duck blood soup in the U.S.? 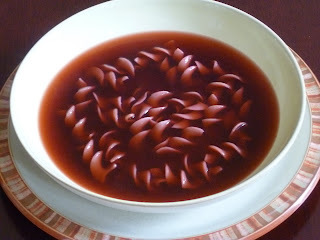 While researching this post, I found a no-blood version, called Blind Duck Blood Soup. It still has a lot of flavor, but avoiding the blood is a better way to go, as far as I’m concerned. It’s an imitation version that gets a lot of flavor from fresh or smoked neck bones, either pork or some variety of fowl – whatever you can get. Try it and let us know how it worked. • 3 pounds fresh or smoked neck bones: pork, turkey, duck, etc. 3. Add prunes, apple, and season slowly with sugar, salt and pepper (watch the salt if using smoked neck bones). Bring back to a boil, reduce heat and simmer slowly, partially covered, for 1 hour or until meat falls off the bone. 4. Taste again and adjust the seasonings, including the vinegar or lemon juice, to your own palate. Add the seasonings slowly, and keep tasting. The broth should have a slightly sweet tone from the plums and sugar, but with a light and soft contrasting tartness from the vinegar or lemon juice. Remove meat from bones and return to pot. I'm old enough to snicker at the suggestion that one must get certified 'fresh and safe' blood! My grandmother was always amused by a squeamish reaction to the blood component of czarnina. She'd point out that most fresh (as opposed to smoked or preserved) meats contained a portion of blood which everyone tends to savor as fond in the skillet for a sauce or gravy, as the remaining "juiciness" in the meat as it is sliced or as flavor in a meat-based soup or stew. Animal blood is a regular part of any meat diet I say to those squeamish about czarnina: Get over it. Back in Ohio, where I grew up, folks have been using pig blood since the state health authorities put the kibosh on most fowl blood. Here in Tucson it's not that easy to find any small portions; pig blood was available from one butcher, but it was in five-gallon lots. I've taken to pureeing chicken livers in my food processor, liver being readily available and one of the most blood-rich organ meats. Maybe it ain't gramma's but it sure tastes like czarnina to me.